A man flying out for a skiing holiday had an unusually quiet flight as he had an entire plane to himself. This dramatic footage shows a British Airways plane attempting to land in Gibraltar. A woman has died after a US passenger plane blew an engine at 32,000ft and got hit by shrapnel that smashed a window, causing her to be partially sucked out of the window. While the skies above Aberdeen might be grey right now, one plane passenger got lucky to capture this great footage of the city through a break in the clouds. A passenger plane was involved in a “near miss” incident with a glider in the North-east, a new report has said. 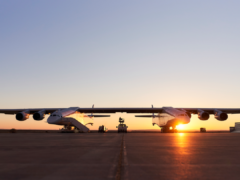 Stratolaunch, the world’s largest aeroplane, has completed a significant test on its road to launching as a real aircraft – taxiing down a runway at more than 40 miles per hour. If you're scared of flying then this probably won't help. A woman has described the terrifying moment she was woken by friends telling her there was a problem with their plane – before a “burning smell” filled the cabin. A plane has crashed near a golf course in Fife. A pilot has escaped serious injury after his plane crashed into a busy street. Get your Samuel L Jackson gags ready because an actual snake hitched a ride on an actual plane. The Air Accidents Investigation Branch’s final report into the Shoreham Airshow disaster – which killed 11 people and injured 13 when a jet smashed on to the A27 in West Sussex on August 22 2015 – has been published. A plane has crashed into a shopping centre in a suburb of Melbourne, Australia, shortly after take-off, killing the pilot and four American tourists on a golfing holiday. This footage shows the moment an aircraft on approach to London's Heathrow airport was struck by lightning. A man has spoken of the “total weirdness” of encountering his doppelganger after boarding a flight to see him sitting in his seat. A PLANE was forced to make an unplanned landing at Aberdeen International Airport today. A MISSING plane has crashed near a Scottish village today.